HELPING HAND: BPW Transpec is helping students with the donation of a disc brake semi-trailer axle and specialised tools. CENTRAL Queensland University could be setting an educational trend after buying its own collection of second-hand, heavy-duty vehicles for training heavy vehicle industry apprentices at its Mackay campus. The "fleet”, bought at a cost of around $60,000, includes a prime mover, a tipper and a pair of loaders and means students can complete their TAFE Vocational Education and Training certificate studies locally, rather than having to travel off site. A 2011 Mack Trident prime mover is the undisputed star of the "new-old” fleet and, not surprisingly, all the apprentices are eager to get their hands on it. That it had a relatively hard working life also happens to work perfectly for instructors and students alike. "With more than a million kilometres on the odometer the truck has its faults, which makes it an ideal teaching and training vehicle for our students,” the university's deputy dean for vocational education and training, Steve Bird, said. 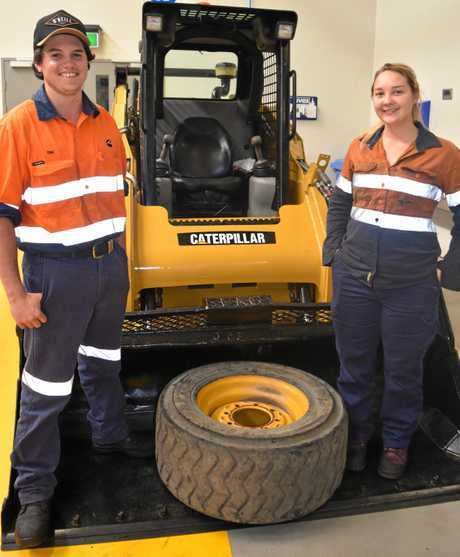 The Mack has pride of place at CQUni's new $46million Trades Training Centre at Mackay's Ooralea campus alongside other training "toys” including a Caterpillar 432E backhoe loader and a Caterpillar 242B skid steer loader. Mr Bird said that, until the vehicles were purchased earlier this year, third- and fourth-year apprentices were forced to travel almost 350 kilometres south to Rockhampton twice a year for hands-on, block-release training. "Now we're proud to have industry-standard resources on hand to expose our students to real-world diesel fitting practices locally,” he said. First-year students have enjoyed machine testing the Mack truck and fixing the CAT. First-year apprentice Tim Borg was one of the first students to train on the Mack after its arrival and said it was good to have a pre-loved, genuine piece of equipment to work on. Tim, a Cummins apprentice training in diesel fitting (heavy automotive) said that, because of the ages and conditions of the second-hand fleet there would always be fixes to be found, such as cracked seals and oil leaks from worn gaskets, that were outside the usual tear-downs and rebuilds. The need for the training facility is borne-out by the strong student numbers. Currently, the university has more than 350 trainees spread across its campuses in Mackay, Rockhampton and Emerald. Steve Bird said a dynamometer facility and hydraulics shop are also under review for the Mackay campus. The university's Emerald campus, which is the main training base for the flourishing local mining industry, is experiencing solid industry support. "We get great support from the mines and the heavy vehicle industry,” Glen Willer, diesel fitting teacher at the Mackay campus, said. 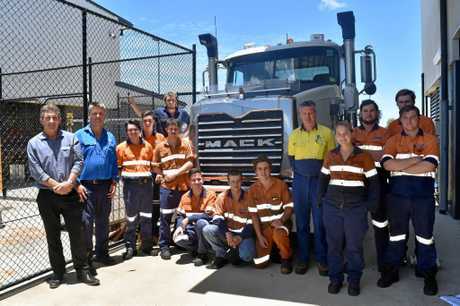 Deputy Dean Steve Bird, Diesel Fitting Teacher Glen Willer, Resource Officer David Mohan and CQUni apprentices are rapt at the new addition to their fleet - a Mack Trident Truck. CQUni also gets good industry support both locally and nationally. 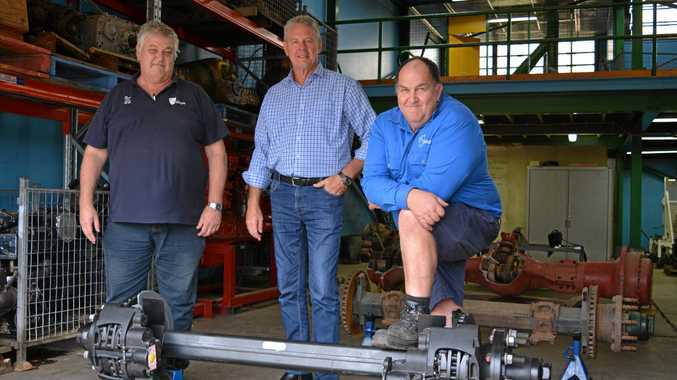 Mr Willer said the college has also had industry technical support from Mackay Mack dealer, Crokers Trucks, and heavy vehicle component manufacturer and supplier, BPW Transpec, recently gifted the campus a disc brake-equipped semi-trailer axle and the specialised tools needed to work on it. The axle and tool package, worth around $3500, was donated to further the education of heavy automotive students and means apprentices get hands-on training, on campus, with the latest heavy vehicle technology. BPW Transpec's product consultant, Geoff Huddy, said the disc-brake semi-trailer axle was currently in use on a range of road-going trailers and its appearance on campus would give students experience with state-of-the-art technology. Interestingly, at a time when apprentice training facilities nationally are experiencing low student numbers, Central Queensland University has a different numeracy problem - staffing numbers. "Because of the mining industry and what it has to offer, our biggest issue is actually getting good quality teachers,” Mr Bird said.